This year, Lockheed Martin will deliver five more F-35s, bringing the number of Dutch aircraft built in America to eight. They are used by the air force for training in the United States. At the end of 2019, the first two F-35s are expected to arrive in the Netherlands. The Italian manufacturer Cameri is building both aircraft, which will be based at Leeuwarden Air Base. The total number of Dutch F-35s will by then total 10 aircraft. The Netherlands first saw the new F-35 aircraft in 2016, when two aircraft toured the country during an introductory flight. With the final arrival of both machines from Italy, the public will be able to see the F-35 Lighting II, the official name of the aircraft, more often. The Netherlands will receive a total of 37 of these 5th-generation fighter aircraft. The F-35 replaces the F-16 that the air force has been using since 1979. The last F-35s will be delivered in 2023, but the Netherlands may buy more. Although the Netherlands already received two test units in 2013, there was no roll out ceremony. The reason for this was that, at the time, the official choice for the aircraft had not yet been made. During the official transfer in Texan Fort Worth, the music was provided by the Dutch DJs Sunnery James and Ryan Marciano. The official roll-out and transfer of the third aircraft was attended by, among others, State Secretary for Economic Affairs Mona Keijzer, Commander of the Armed Forces Lieutenant Admiral Rob Bauer, Commander Air Forces Lieutenant General Dennis Luyt and Director of Defense Material Organization Vice Admiral Arie-Jan de Waard. FORT WORTH, Texas --- Dutch and American officials celebrated the roll out of the first operational F-35A Lightning II for the Royal Netherlands Air Force (RNLAF) at Lockheed Martin in Fort Worth, Texas, commemorating a transformational leap in capability for the future of the Netherlands' national defense. "Check the horizon. The future starts here," Lt. Gen. Dennis Luyt, Commander of the Royal Netherland Air Force, told guests at a ceremony for the Netherlands. "Receiving this F-35 at Leeuwarden Air Base later this year is going to be a huge driver for change for our Air Force and will have tremendous impact on the relevance of our Air Force as part of the coalition," said Lt. Gen. Dennis Luyt, Commander, RNLAF. "We want to be among the best air forces of the world, and the platform of F-35 allows us to do that." Various distinguished government, military and industry guests joined Luyt in attendance at the ceremony including Lockheed Martin Chairman, President and CEO Marillyn Hewson; State Secretary, the Netherlands Ministry of Economic Affairs Mona Keijzer; and Special Envoy F-35, the Netherlands Ministry of Economic Affairs Maxime Verhagen. 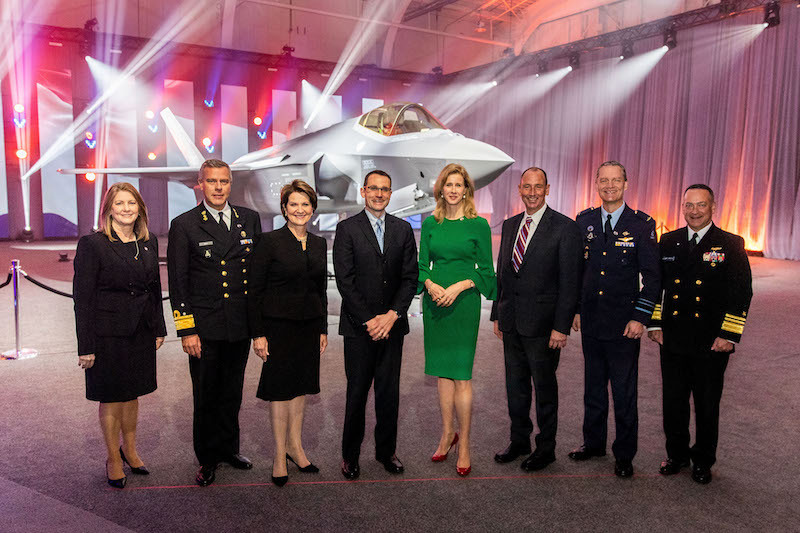 "From the very beginning of the F-35 program, the Netherlands has been a key partner in developing, testing, improving, and maintaining this remarkable aircraft," said Hewson. "Dutch suppliers have provided high-volume production, structural-design support, and advanced technologies, and Dutch aircraft and personnel continue to support ongoing testing and operations for the worldwide F-35 fleet. As we look to the future, the Netherlands will serve as a sustainment hub in the European region for maintenance, repair, overhaul, and upgrade projects." Following the ceremony, the aircraft is scheduled to ferry to Luke Air Force Base, Arizona, where F-35A pilot training takes place. The aircraft is the first operational F-35 and the third Netherlands jet delivered to date. The first two Dutch F-35s were delivered in 2013 and are at Edwards AFB, California, supporting operational testing. The RNLAF plans to acquire 37 F-35As. Dutch industry, including 25 suppliers to date, have benefitted from the F-35 program with contracts awarded for high technology work. As estimated by the Netherlands Ministry of Economic Affairs, the F-35 program has already generated more than $1 billion USD in contracts for Netherlands industry, creating thousands of direct and indirect jobs for the Netherlands over the life of the program. To date, more than 360 F-35s have been delivered and are now operating from 16 bases worldwide. Ten nations are flying the F-35, seven countries have F-35s operating from a base on their home soil, five services have declared Initial Operating Capability, and two services have announced their F-35s have been used in combat operations. With stealth technology, supersonic speed, advanced sensors, weapons capacity and increased range, the F-35 is the most advanced, survivable and connected aircraft in the world. More than a fighter jet, the F-35's ability to collect, analyze and share data, is a powerful force multiplier that enhances all airborne, surface and ground-based assets in the battlespace enabling men and women in uniform to execute their mission and return home safely.